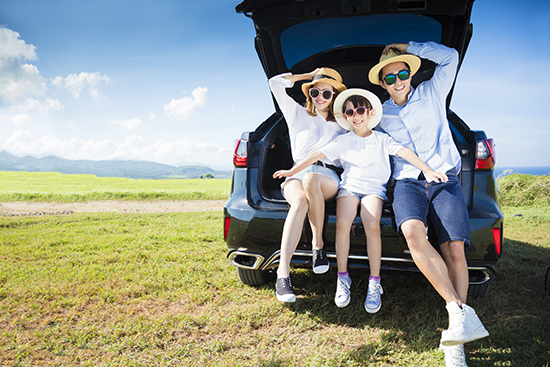 Instead, follow these four steps to help ensure your summer road trip is a success, and memorable for all the right reasons. Inform your mechanic you’re planning on taking a long trip and ask them to give the vehicle a thorough inspection. Items and systems that he or she should check include all fluid levels, their respective filters and when they were last changed, belt tensions and condition, air filter, tire pressure and tread depth, brakes, lights, wipers, history of recommended maintenance having been completed, and presence of any leaks. If the “check engineâ€ light is illuminated or has been coming on periodically, find out why. And even if your vehicle comes back with a clean bill of health – which hopefully it does – there's immeasurable value in knowing that your vehicle is ready to go. Summer’s heat, not winter’s cold, is what really kills batteries – that coupled with age and vibration from an improperly installed battery. Vehicle batteries generally last three to five years, and they don’t provide much advance warning that they’re about to fail. A battery test measures the battery’s performance and provides fact-based insight as to whether it’s time to replace that battery. Some batteries also include the date of manufacture on the battery case, providing quick insight into how far along the battery is in its expected lifespan. The battery should also be visually inspected to ensure that the cables are secured tightly to the battery terminals, that there isn’t any buildup of corrosion on the terminals, and that the battery is clamped tightly in the battery compartment. Warm or even hot air blowing from the vents while the air conditioning is on is disappointing and frustrating, not to mention uncomfortable. Before assuming the worst-case scenario – that the AC system has suffered a major and potentially expensive meltdown – consider that it may just need a refrigerant recharge. Your mechanic should check your tire pressure and tread depth as part of the pre-trip inspection, but that doesn’t mean you should just forget about the tires and never give them a second thought. Good rubber is the only thing connecting your vehicle to the road, and with legal speed limits topping 70 mph and even 80 in some states, you want to be sure your tires are delivering the safest performance possible. Chronically underinflated tires wear out faster, make the vehicle handle poorly, and increase the amount of fuel burned, so start by making it a habit to measure each tire’s pressure on a regular basis. To achieve the most accurate reading, take the pressure reading when the tires are cool and haven’t been driven for several hours. Tires should be inflated to the PSI number listed on the inside of the driver’s side door or in the owner’s manual, not to the maximum pressure listed on the tire sidewall. â€¨Plan and execute your vehicle maintenance wisely and your summer road trip should be a breeze.